Fall is in the air. And in the grocery store. Apples, apples everywhere! Trust me though, that is by no means a complaint. And stocked right beside all the apples sourced from several local orchards are just about every local brand of cider you could hope to find. And if you’re like us, you look forward to that taste as an integral part of any ‘Fall’ experience. But did you know that cider can be so much more? Betcha never thought about using it to make gravy, did ya?? Prepare to have your eyes opened wide to a wonderful new world of cider possibilities. This recipe allows you to easily cook up a chicken and gravy based dinner for your family, without any of the headaches or fears of making a more traditional gravy. It’s a thinner gravy, but it’s also low in fat. It’s sweet and savory and, thanks to the addition of the cider, full of Fall flavor. It’s a match made in Heaven, well I suppose I should say a match made in Autumn. Season the chicken liberally with salt and pepper. 2. Heat the butter and olive oil over medium high heat in a large skillet or Dutch oven. 3. Add the seasoned chicken to the pan, and brown on each side for about 2-4 minutes, or until cooked through. Remove the cooked chicken from the pant, and set aside. 4. To the heated pan, add the broth, cider, parsley, and garlic. Bring the mixture to a boil, and use a spatula or spoon to deglaze the pan. Stir in the corn starch mixture, and reduce the heat to medium and let the mixture simmer, stirring occasionally, until thickened. Season the gravy with salt and pepper, to taste. Add the chicken back to the skillet and remove the pan from heat. 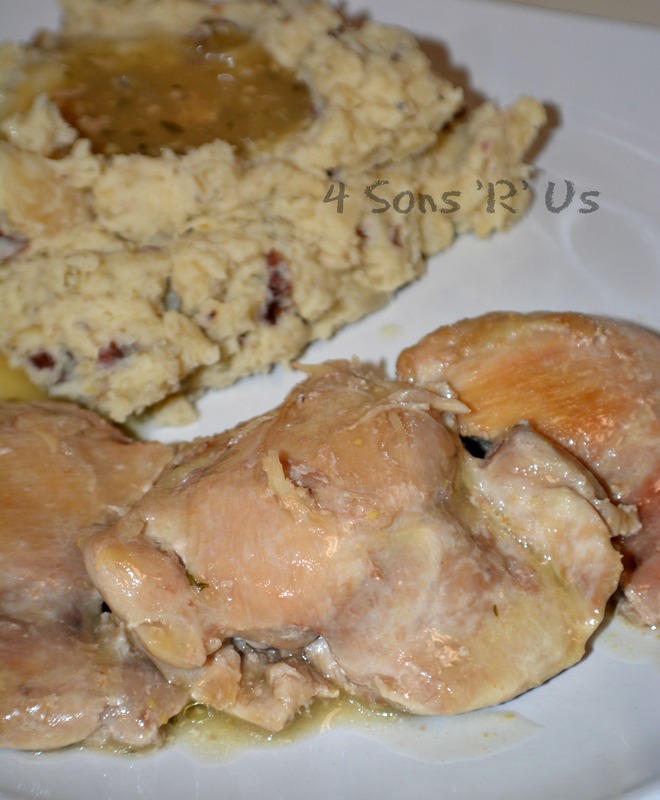 Serve the chicken with the a liberal serving of gravy poured over both the meat and over the mashed potatoes or rice. 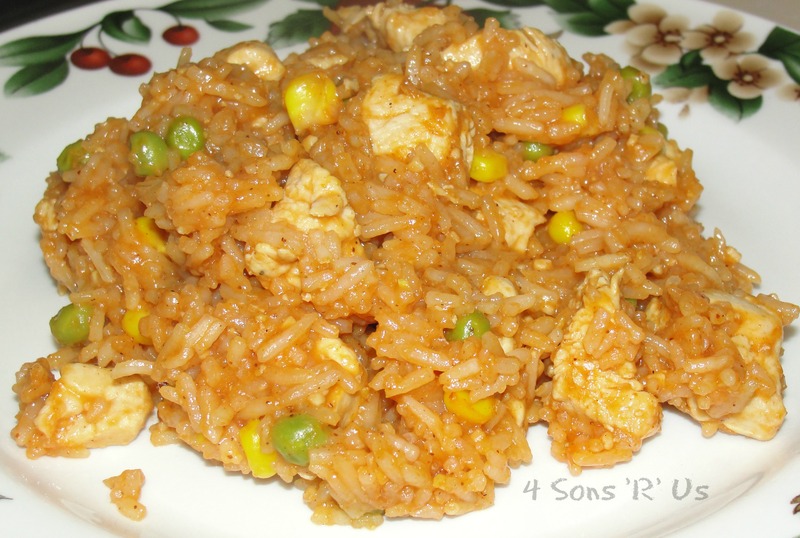 Posted in Recipes and tagged Chicken, dinner, one pot meal, quick and easy. Bookmark the permalink. 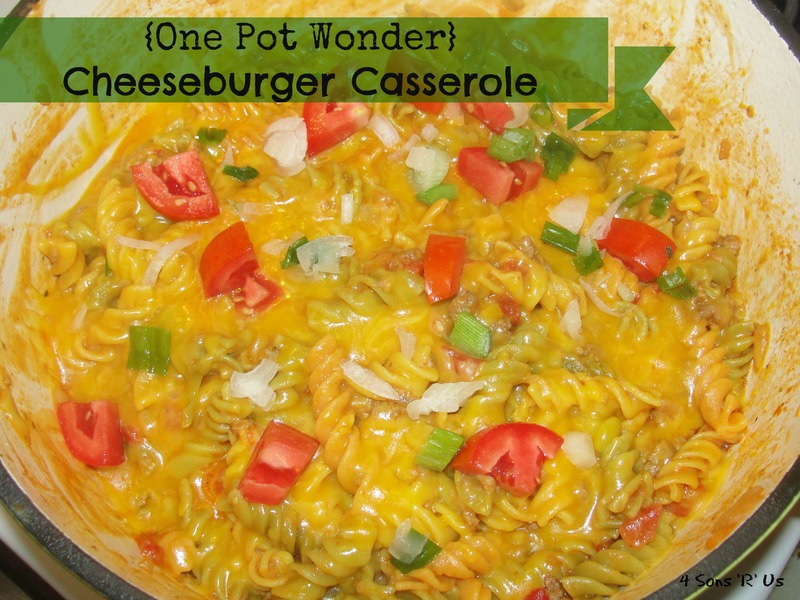 Today we’re back with another one pot wonder. 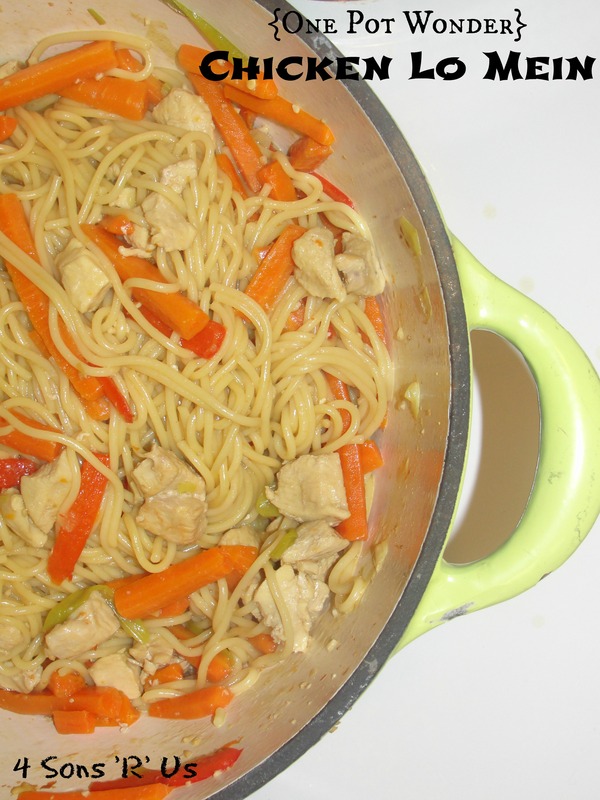 A dish that from start to finish, dirties only one pot. ONE. It’s one of the seven wonders of the weeknight kitchen world. 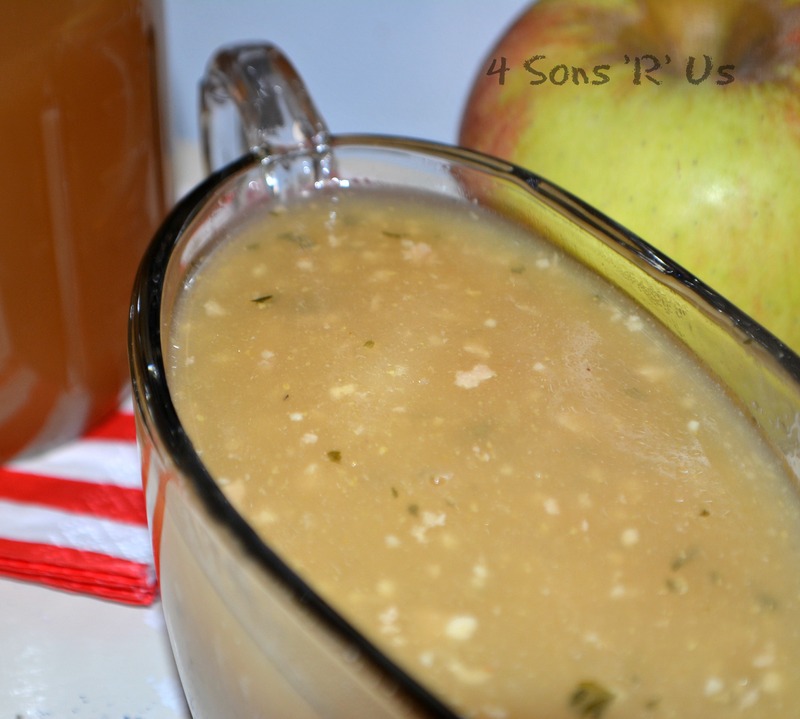 I tweaked the original recipe to what we had on hand and it was delicious! I mean, REALLY delicious. As in I think I ate 3/4th of the entire dish. As in, it was great the first time around and great as leftovers for lunch the next day. As in, I think this is one of my new favorite go-to, all-in-one meal. As in you need to try this right now. Like TONIGHT. This meal is new, it’s fun, it’s healthy, and it’s easy. How many other nights are you able to get a home cooked, form scratch meal on the table in under 20 minutes? And the flavor? With the word balsamic in the title you know it’s got to be good, right?! Enjoy this meal as is, or fortify it with a few simple carbs in the form of a scoop of your favorite pasta or rice on the side. In a small bowl, stir together the dressing, vinegar, honey and red pepper flakes until evenly combined, and set aside. 2. In a large skillet, or Dutch oven, heat the olive oil over medium-high heat. Season the chicken with salt and pepper, before putting the tenderloins into the skillet. Cook the chicken about 6 – 7 minutes, rotating once halfway through cooking, until chicken has cooked through (meanwhile, prepare the veggies). Add half the dressing mixture to the skillet and turn the chicken to make sure it’s evenly coated. Transfer the cooked, coated chicken to a large plate or a serving platter while leaving the sauce in the skillet. Add in the green beans and carrots, season with salt and pepper (again, to taste) and cook, stirring frequently, until still crisp, but also tender, about 4 minutes. Transfer the veggies to plate or platter with chicken. 3. Add the remaining dressing mixture to the skillet and cook, stirring constantly, until thickened, about 1 minute. 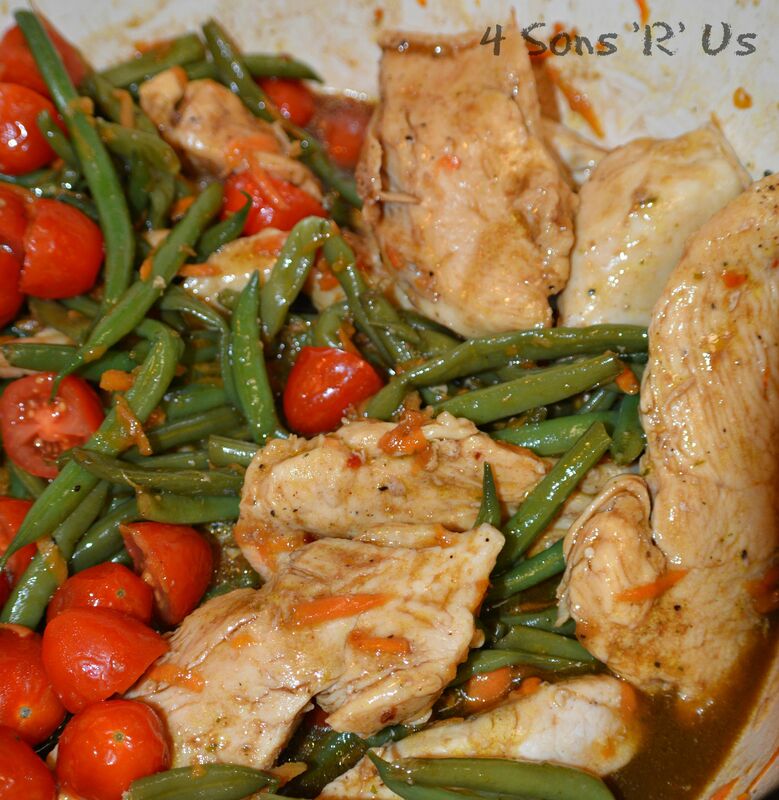 Add the cooked chicken, cooked green beans and carrots, and the tomatoes back to the pot. Toss everything to coat, and serve. 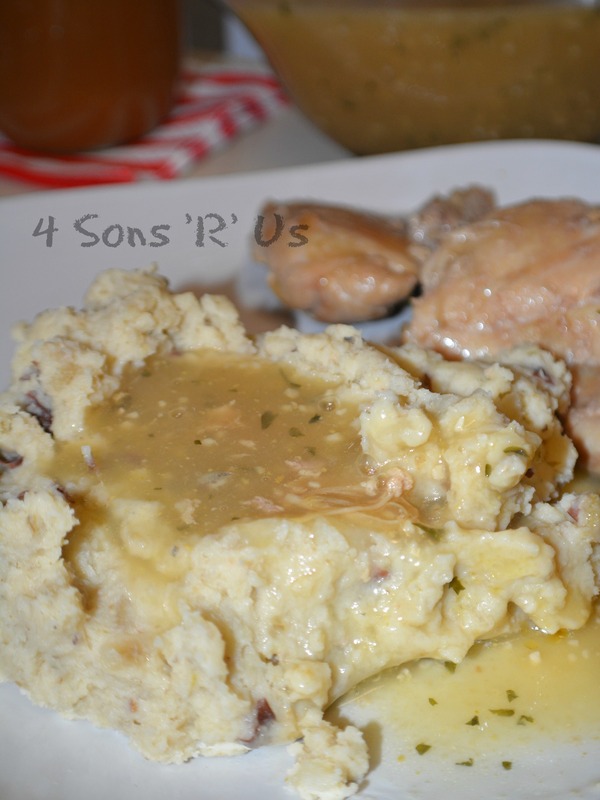 Posted in Recipes and tagged Chicken, diabetic, dinner, healthy, one pot meal, quick and easy. Bookmark the permalink. Everybody runs their kitchens a little bit differently. It’s just one of those places that is immune to the laws and natural orders of the world and is totally unique to it’s user. And every cook is unique from their specific processes right on down to their individual food philosophies. We each have our favorite tricks of the trade and are partial to certain tools and certain methods. Be that as it may, there are certain things you’ll find in any well-stocked, well-used kitchen. They’re kitchen must-haves, and often their little multi-purpose, miracle working, border-line magical devices. Take the trusty dutch oven for example. Its my my favorite one stop, one pot ‘thing’ in my entire kitchen. And let me just mention again that this bad boy bakes. bread. Flawless, fool proof bread. So, if you don’t have one … get one. 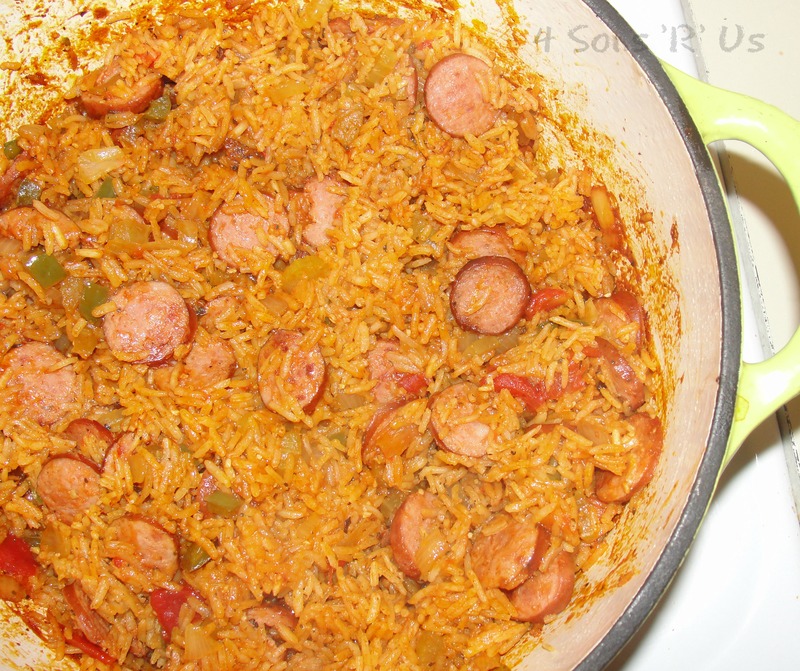 Oh, and let’s add a nice little kick to our week night meal with the Cajun flavors of this jambalaya in a quick one pot meal that is also fool proof. And simple. Brown your meat, boil your rice, and mix everything together to finish cooking in the oven, all in one fantastic pot. 1. Heat a dutch oven over medium-high heat, and once it’s good and hot, add in the oil and butter. Add in the sausage and allow it to brown a bit on both sides and caramelize. Remove the sausage to a bowl or a plate and set aside. 2. Next reduce the heat to medium/medium-low and add the onion, pepper, celery, and garlic to the sausage drippings in the dutch oven. Sprinkle the dry seasonings (paprika, garlic & onion powder, cumin, Cajun & Italian seasoning) over the veggies. Add the bay leaves and salt & pepper, as desired. Add in the tomato paste and let everything saute for a few minutes. 3. Add in the rice, stirring to make sure it’s evenly incorporated and well coated. Continue sauteing everything until the vegetables are just tender. 4. Add in the chicken broth and the tomato sauce, and return the sausage to the pot. Stir everything together, and salt and pepper again (if needed) to taste. Bring the mixture to a boil. 5. Turn off the heat, immediately cover the dutch oven with it’s lid, and transfer the dutch oven to an oven preheated to 375 degrees. 6. Cook for 25-30 minutes, or until the rice is tender and has absorbed all the liquid. If you don’t have a Dutch oven, fear not, you can still enjoy this meal at home. Follow steps 1-4 in a large pot or even a skillet. For step 5, transfer everything to a 9×13 casserole dish. Cover tightly with aluminum oil and bake as directed. You may need to add 45-10 minutes to the cook time to allow the rice to absorb all the liquid. Just keep an eye on it after the 30 minute mark. 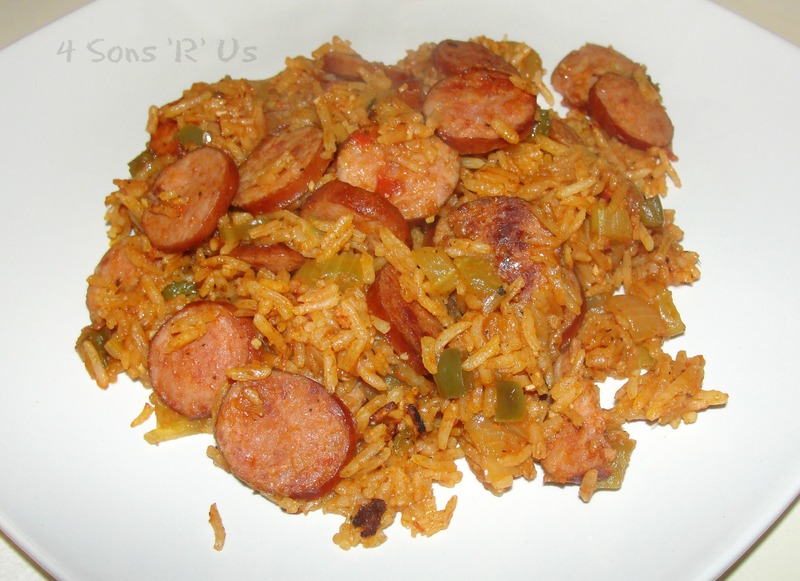 Posted in Recipes and tagged dinner, one pot meal, rice, sausage. Bookmark the permalink. Do you ever get an intense craving for a good philly cheesesteak sub? Like an, ‘I know I’m not pregnant or anything, but I have got to have one right. now’ kind of craving? (Come on, I know I can’t be the only one!) But then there’s all these impossible obstacles in the way, like not wanting to go to the sub shop, or the store, or perhaps maybe you don’t have bread in the house, or you don’t want a bunch of carbs, or you don’t want to chew a lot… guess what? I have a solution! Philly Cheesesteak Stew. I’ll admit we’ve never been to Philly…maybe someday….but we sure do like their sandwiches. And, I figured if their sandwiches were good, then a soup would be, too! Boy, was I right!! If you like the philly cheesesteak sandwich, then you got to try this soup. All the flavors of the famous sandwich you love come together here in a thick, and hearty stew that is sure to satisfy any level of cheesesteak craving. See? We’ve got you covered. 1. In a large bowl, toss the steak strips with the salt and pepper. Add 2 tablespoons of flour and toss again, making sure the slices are well coated. 2. Sear the steak, in two batches, over medium-high heat, so that both sides brown, only about 1-2 minutes per side. At this stage we still want the centers pink. Once browned, set aside. 3. Next, add the onions and mushrooms to the same skillet and brown for a few minutes until the onions are translucent. Now, add the garlic powder, salt, pepper and the last 2 tablespoons of flour. Stir to ensure the onions are coated with flour. 4. Add in the beef broth, 1/2 cup at a time, stirring between each addition so that it thickens, until it’s finally fully incorporated to avoid lumps. Allow to thicken and bring to a bubble, then reduce heat to medium low and simmer for 30 minutes. 5. Add in the peppers in the last 10 minutes of simmering. Add beef after the 30 minutes and let simmer, about 5 minutes, so that it’s heated through. 6. Cut a circle in the top of each bun and remove most of the insides. Set on either a foil covered pan, a pan with a non-stick baking mat, or a pan sprayed with non-stick cooking spray. Add one slice of provolone to the inside of each bread bowl. 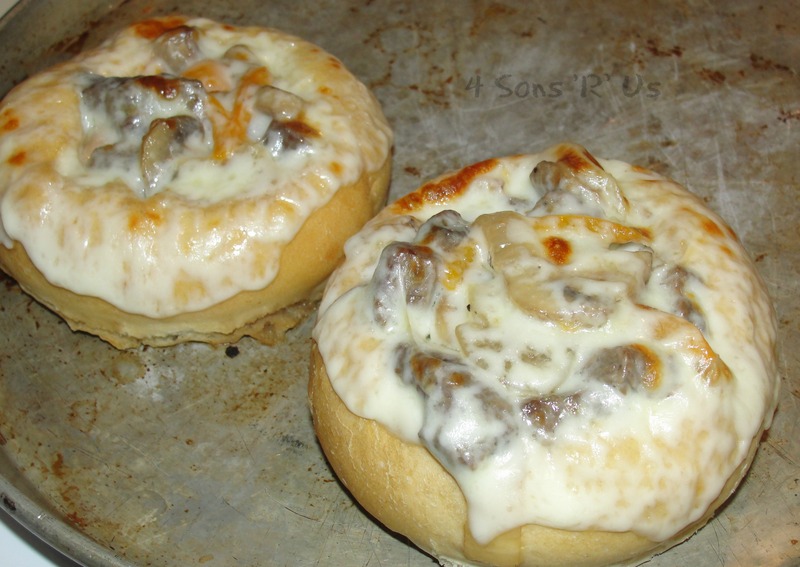 Carefully spoon stew into each bread bowl over top of the cheese, and then top the stew in each bread bowl with two slices of provolone. 7. Place the pan under the broiler for 2-3 minutes until the cheese is bubbling and begins to turn a golden-brown. 8. Serve hot with the removed pieces for dipping. Posted in Recipes and tagged one pot meal, soup. Bookmark the permalink. For years, we bought the box mix and simply added ground beef to it. We were in heaven. It was divine. It tasted great and it was quick. 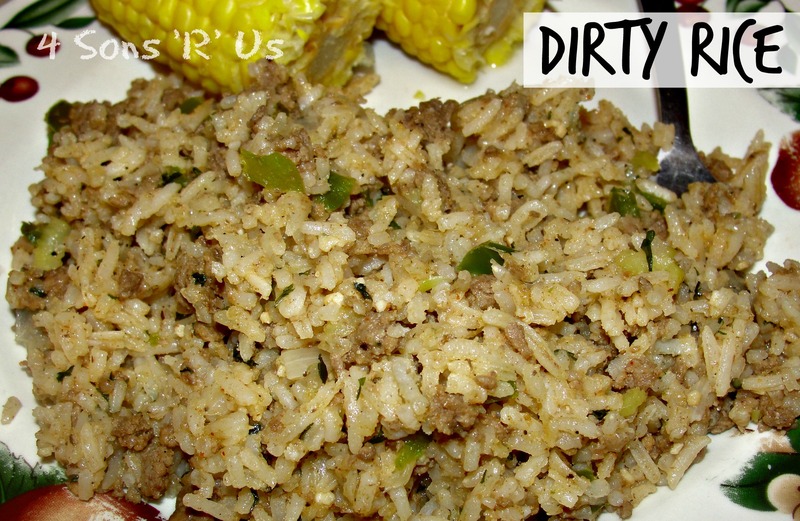 Everything we ever needed or wanted in our dirty rice dinners. Or so I thought. Sometimes I have readers send me links to recipes they think will tickle my fancy or that they want an opinion on before venturing into uncharted territory. THAT’ is how this recipe fell into my lap, err inbox, late last year, and I can’t say thank you enough! So. Dirty Rice. If you’re from the South, especially the deep south and any ‘bayou’ regions, you’ve probably grown up on the stuff. For those of you not from the deep south, a fun fact about ‘dirty’ rice. The traditional Cajun dish get it’s name from the white rice it calls for that turns a ‘dirty’ color when cooked with small pieces of chicken livers. Yeah. I didn’t like liver when I was little, and it’s still a no-go now. I know, I know, your palette can change as you age, but I’m not chancing it. No liver for this Mama. I get my rice pleeeenty dirty using good ol’ ground beef. Don’t like beef? Chicken sausage or pork sausage both work great in this meal. If you’ve got one pot, and one 25-minute window of time, you’ve got this amazing dinner that will leave you with only ONE dish to clean. Priceless, right?! 1. In a large skillet, heat up the oil, over medium heat. 2. Add the ground beef, celery, pepper, garlic, and onion and cook, breaking up the beef while stirring, until the ground beef is cooked through and the vegetables are tender. 3. Add the parsley and creole seasoning, starting on the low end with 1 tbsp and tasting before leaving it or increasing the amount as desired, stirring to combine. 4. Then stir in the cooked rice, and saute for 5 minutes, or until heated through, over medium heat. Posted in Recipes, Uncategorized and tagged dinner, ground beef, one pot meal, quick and easy, rice. Bookmark the permalink. 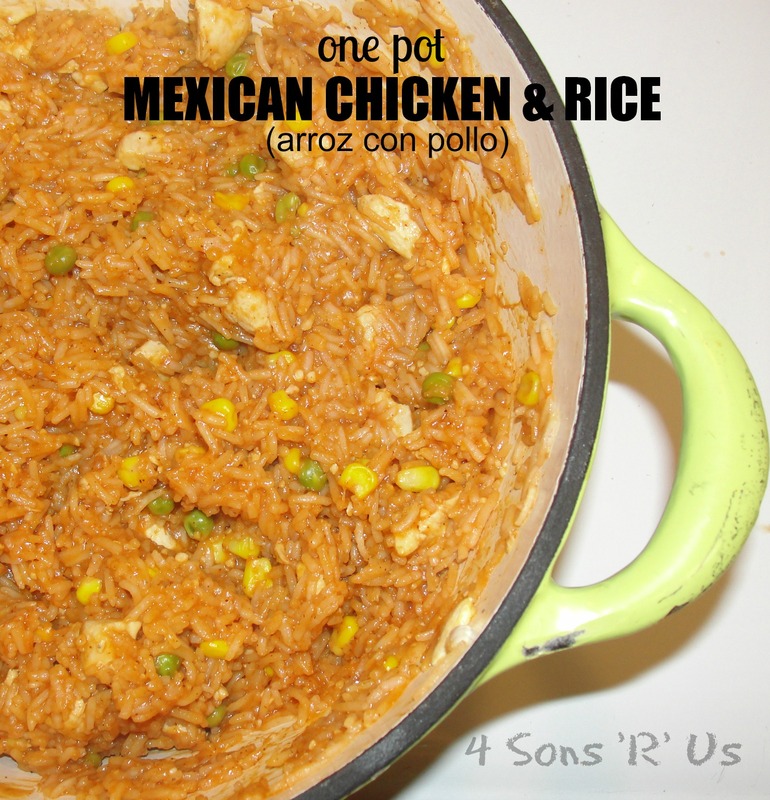 Posted in Recipes and tagged Chicken, dinner, Mexican, one pot, one pot meal, quick & easy, rice. Bookmark the permalink. Over the years I’ve learned I can’t ask the sons to spot clean the living room or to clean in general without supervision. Otherwise everything ends up in the toy box. Day old, dirty socks, sippy cups, Dad’s tools, remotes, candy wrappers. You name it, if I can’t find it and they’ve cleaned recently, it’s in the toy box . While it’s frustrating to no end, I do understand the urge. Shoot, even as an adult I have the urge to do things as simply as possible. Their motivator for doing the bare minimum to get by? Usually, the great outdoors is calling their name, or their video games. Mine? Supply and demand. Some days there are just too many things needing my attention, and there’s only one of me with a limited number of hours in the day. Enter the wonderful world of one pot meals. I simply cannot express the love I have for them. The pleasure I get from knowing I literally just threw a bunch of stuff into a pot and it turned into a delicious meal everyone loves is addicting. I just can’t keep it all to myself. I’ve got to share the love, or in this case, the recipe. Be careful though, the one pot meal craze is contagious! 1. In a 5 quart pot, heat 2 Tbsp olive oil. Add onions and peppers and saute until soft, about five minutes. Add garlic and saute one minute. 2. Add Italian sausage and pepperoni and cook until sausage is no longer pink. 3. Add pasta, beef broth, tomato paste, pizza sauce, water and seasonings. Stir and bring to a boil. 4. Cover and simmer for 15 minutes or until pasta is tender, stirring at least once, . 5. Remove from heat and stir in mozzarella cheese, reserving 1/4 cup for sprinkling on the top. Replace the cover and let sit for five minutes. Garnish with diced green peppers and shredded Parmesan, if desired. 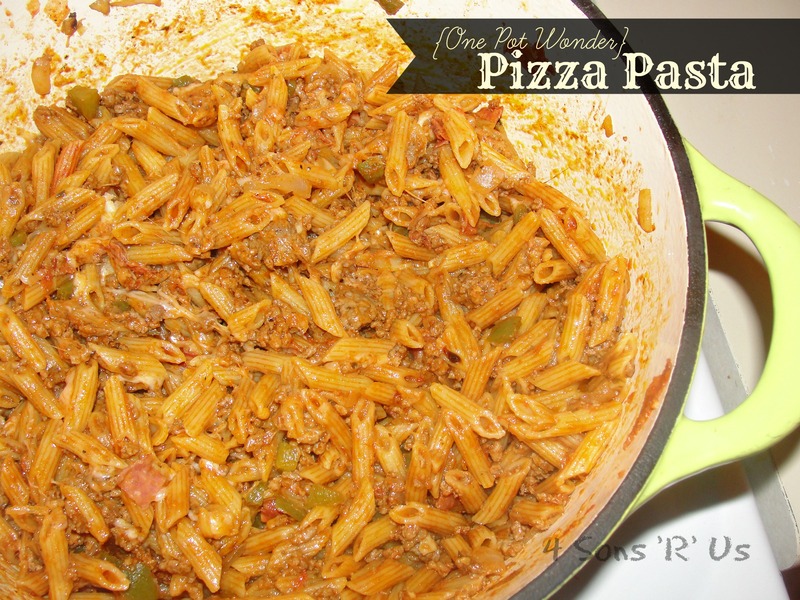 Posted in Recipes and tagged dinner, one pot meal, pasta, pizza pasta. Bookmark the permalink.